Selectively permeable membranes made from renewable plant-based materials could significantly improve the environmental credentials of the chemical industry. A KAUST team has tested the viability of cellulose membranes to show they can effectively clean wastewater. 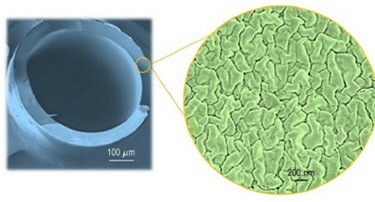 Using polymer membranes to separate mixtures is common in desalination, where seawater passed through membranes becomes potable because the membrane blocks the salt. Similar membranes are being adopted by the chemical industry as a green method for purifying products or cleaning up waste. However, the membranes are typically made by dissolving polymers in toxic, volatile organic solvents. Replacing these solvents is a key aim of KAUST Professor Suzana Nunes. A potential replacement examined by Nunes and her team are nonvolatile solvents called ionic liquids, which can have significantly less environmental impact than organic solvents. They can also dissolve membrane starting materials that are difficult to dissolve in organic solvents, such as cellulose. “Cellulose is an abundant natural polymer which can be sourced from plants and bacteria,” says DooLi Kim, a former Ph.D. student from Nunes’s team, now working on a postdoc at the University of Twente in the Netherlands. The benefits of cellulose, including its sustainability and very strong yet chemically tunable structure, make it a very promising green membrane material. The team’s cellulose membranes were very effective for separating oil-in-water mixtures. “Cellulose membranes prepared with hydrophilic ionic liquid showed almost 100 percent removal of crude oil from oil-in-water emulsions,” Livazovic says. “The cellulose based membrane had incredible antibiofouling performance,” Kim adds. Thanks to its hydrophilic surface, fewer oil deposits stuck to the membrane, and any that did adhere were easily washed out. One remaining hurdle is the high cost of ionic liquids compared to organic solvents—although the team previously showed ionic liquids can be recovered up to 99 percent through simple steps such as distillation. “If recovered ionic liquids can be reapplied in the membrane manufacturing process, production costs will be reduced and the process would be even more eco-friendly,” Kim says.